Amongst the many strands of American inspired revivalist music – whether it be Appalachian folk or pre-war Blues, the sounds of the sixties folk boom or the reclaiming of minstrelsy and old-time music one musical thread that has not been so heavily championed is – with the possible exception of Rockabilly and hep-cat music – that strange melange of styles that was present at the birth of Rock and Roll. 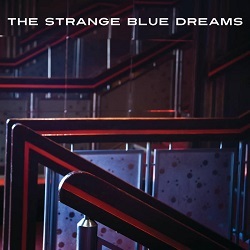 Scottish band The Strange Blue Dreams are setting out to redress the balance a little on their debut album with a diverse collection of songs that sound like nothing more or less than a 1956 juke box. These are more than just faint echoes – although Reverberatin’ Love is built around a powerful reverberating echo chamber vibe which adds a ghostly graveyard feel to a track peppered with carefully inserted lyrical references to echoes and endless sweet notes which “will in the end decay”. Twilight Zone isn’t a reference to the TV series – which in the timeline of this music is still years in the future – instead it’s a slow ballad, enlivened with booming drums and guitars which just chip in here and there before David Addison’s vocal heads for the crescendo. It’s the sound of crooning singers and guys with mandolins trying to come to terms with this rock and roll thing the kids are all fired up about. Jungle Drums strips it back to the basics, a steady beat and a fuzzy surf-rock guitar, it captures perfectly the blend of a Tarzan obsession with rock and roll’s oft embracing of the semi-novelty feel. The same sensibilities are brought to the rock and roll cowboy ballad (That’s the place) I’m falling that slips seamlessly into a backward talking damn fine cherry pie eating Lynchian universe. The Strange Blue Dreams have done for the roots of Rock and Roll what Andy Partridge did for re-imagined psychedelia with The Dukes Of Stratosphear – these are convincing new songs that should have existed at the time. And, after a few listens it’s hard to remember that they aren’t sixty years old – it’s only the lack of vinyl scratch and pop that marks them out as new. It’s cool, daddy-o, and gone, just solid gone. Dig out those drainpipe trousers, the leather jacket and the your blue suede shoes and get ready to rock. And also get ready to roll.